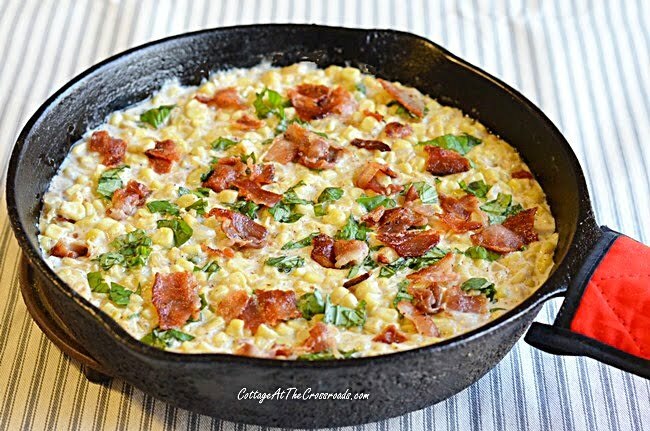 Skillet creamed corn is comfort food at its best! 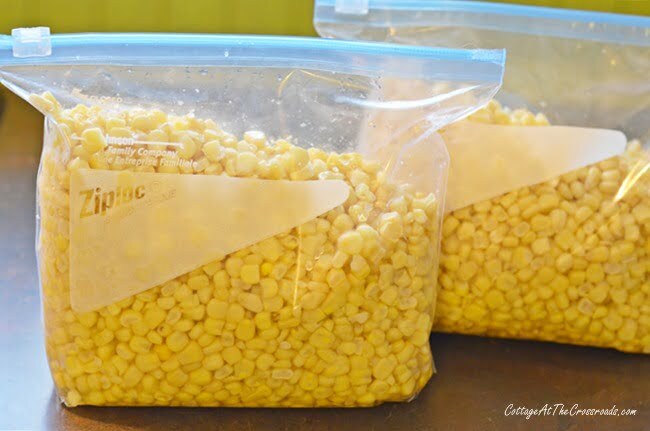 By using frozen corn, you can easily achieve that fresh from the garden taste year round. It’s that time of year when winter has lost its luster and there seems to be no end to the frigid temperatures. It’s cold here in South Carolina, and I am not a cold weather gal! I am, like many of you, dreaming about spring and being able to get outside in the garden. When I think about the garden, my thoughts turn to one of life’s sweetest pleasures-fresh cut corn cut from the cob served with a side of sliced, homegrown tomatoes! 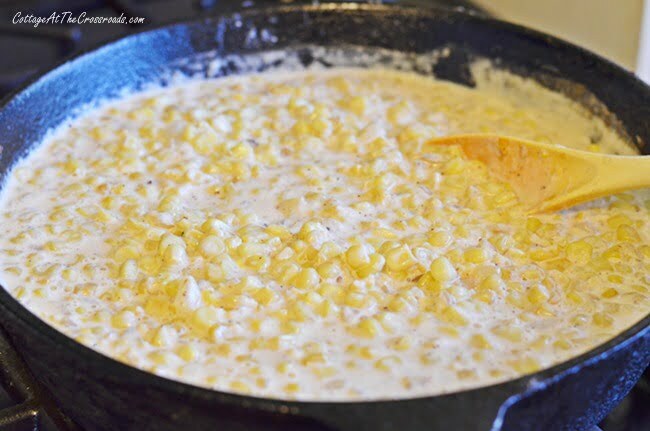 But until that day comes, I’m sharing my recipe for Skillet Creamed Corn that is the next best thing to that sweet summer delicacy! This dish is so, so comforting and you won’t believe how easy and quickly it comes together. I’ll have to admit that it’s not the healthiest dish, but sometimes we have to indulge, don’t we? There is one special ingredient in this dish that you must include in order to get that fresh, summer taste from frozen corn. And to top it off, it can go from stove top to the table all in one pan. First thing you will need to do is to cook 6 slices of bacon in a black iron skillet. Remove the bacon to drain on paper towels and reserve 2 tablespoons of the drippings in the pan. 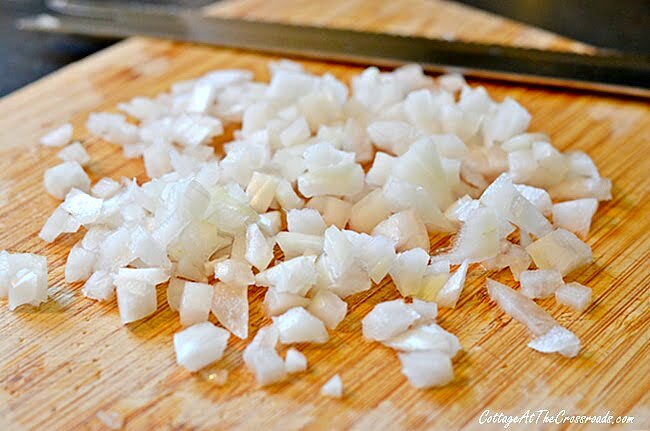 Add 1 chopped onion to the hot drippings and cook about 5 minutes until tender. Stir in a 16 ounce bag of thawed, frozen whole kernel corn. This is some Silver Queen corn that I froze last summer, but you can use frozen corn from the grocery store. Cook the corn 5-7 minutes, stirring occasionally, and then remove the corn and onion mixture from the heat. 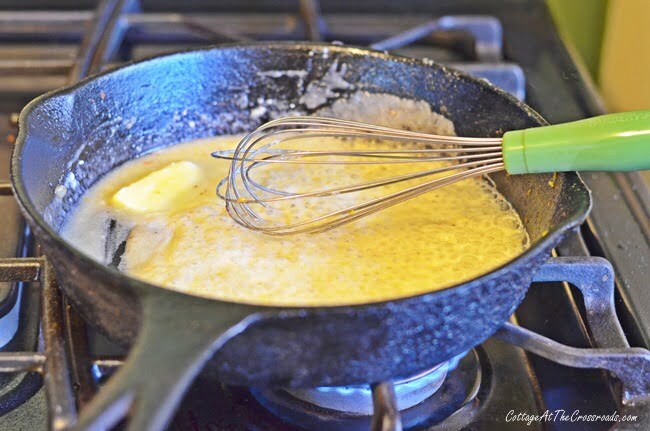 Melt 3 tablespoons butter in the skillet, and whisk in 3 tablespoons all purpose flour into the butter. Continue to whisk and cook over medium heat for about 5 minutes until it turns a golden color. Gradually whisk in 1 1/2 cups half and half until smooth. Add the corn and onion mixture back into the skillet, season with salt and pepper, and cook 5 minutes until thickened. Remove from the heat. Now here is what gives this dish that fresh, summer flavor. 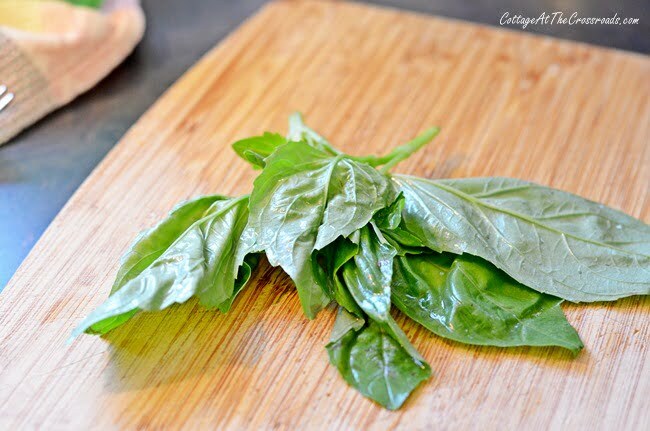 Chop some fresh basil until you have about 1 tablespoon. Don’t be tempted to skip the fresh basil and dried just won’t do! Crumble the cooked bacon on top, add the chopped basil, and take it to your table. Step back and wait for the compliments! 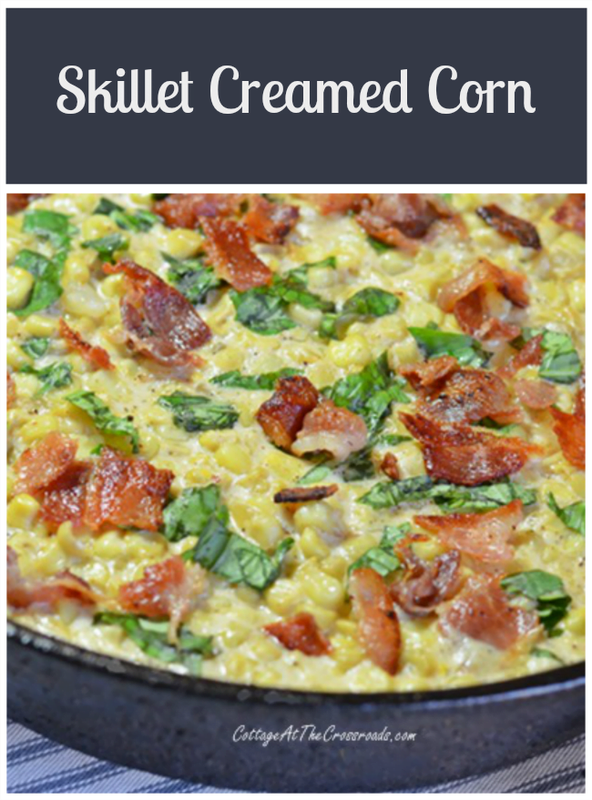 Ahh, I might just be able to make it through the winter with this skillet creamed corn! How about you? 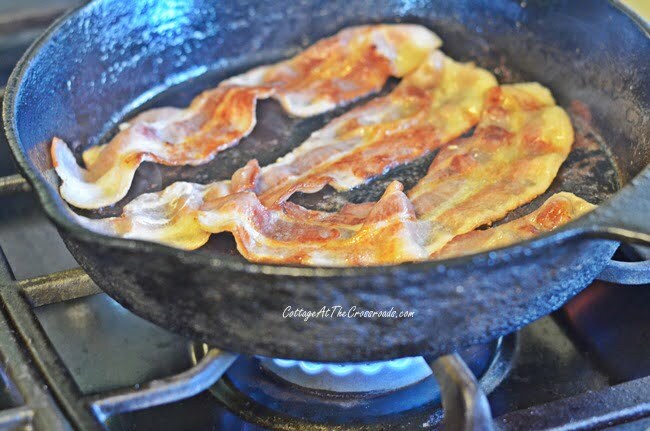 Cook bacon in a cast iron skillet over medium heat until done. Remove from the pan and drain on a paper towel and set aside. Pour off all but 2 tablespoons of bacon drippings and saute the chopped onion in the drippings about 5 minutes or until tender. Stir in the corn and cook 5-7 minutes, stirring occasionally. 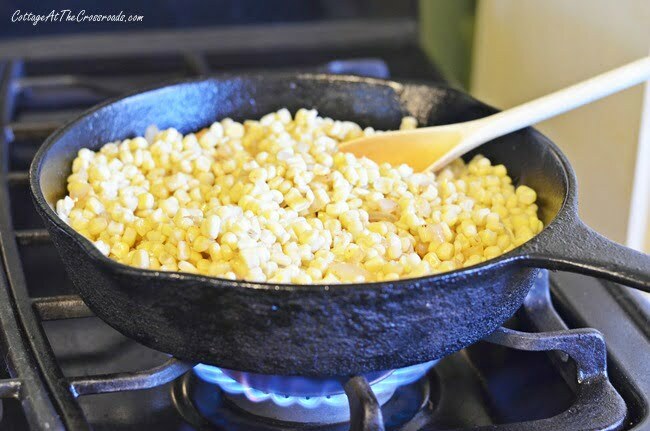 Remove the corn and onion mixture from the skillet and set aside. 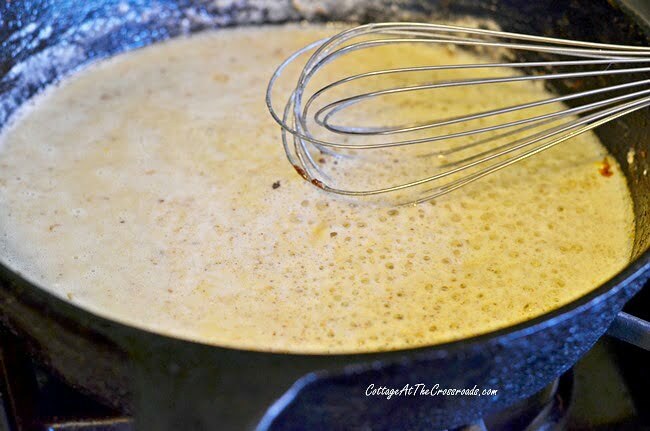 Melt 3 tablespoons butter in the skillet and whisk in 3 tablespoons all purpose flour. Cook the flour and butter mixture about 5 minutes while continuing to whisk. Gradually whisk in the half and half until smooth. Add the corn and onion mixture back to the flour mixture and season with salt and pepper. Cook 5 minutes until thickened. Remove from the heat, crumble the bacon and chopped basil on top. « A New Blog Design! Can’t wait to make this one. Pinning. Wow, this sounds delicious! 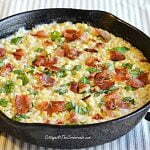 Looks like a great comfort food dish! Thanks for sharing! This looks delicious! Will try this recipe out. This looks delicious. I may be tempted to add some cheese. Yum! Yum, that sounds and looks sooo good! I’ve been enjoying your site here for a while now, just wanted to thank you for it. I’m an Alabama girl, born and raised. But ya’ll making South Carolina look like somewhere I’d like to visit! Love the old home place. 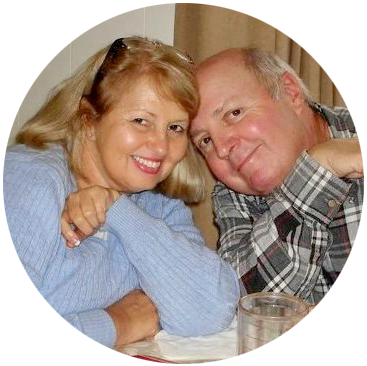 We’re living in an old home that my husband’s parents lived in many years ago, after my husband retired from the military. Renovations have been going on since 1979! We’re now almost done, just the bedrooms to go….I’ve got to clear out one so we can rip up the old carpet and put down new flooring. Wish me luck…..
Oh this brings back so many memories as this was my dad’s favorite vegetable dish…He taught my mom how to make it and we must have had it at least once a week!…He was an Iowa Farm Boy and loved his corn. Thanks Jane and you two have a great weekend! OH, this looks delicious! Thanks for sharing! Pinning! It’s really, really, really good. No, I’m not kidding.